It's just a few days until London Fashion Week commences, so I thought I would share some of my stylistic inspirations for this season. I am not one to really go for it in the fashion stakes. I know what I like and I like what I know... and no matter how confident I may be feeling, nothing makes me feel better than a simple cream button-down with skinny black jeans (current favourites? these bad boys). Staying true to my own style, these Fit for Fashion Week ensembles- his and hers, of course- are pretty relaxed and understated, while still nodding to key trends for the season. 1. A classic white t-shirt is an item that will never date, and therefore it makes little sense to scrimp on such an essential. James Perse t-shirts are second to none, and this simple crew neck style available from www.matchesfashion.com is a premium cotton blend that layers wonderfully. £45 here. 2. Cutler & Gross is one of the most respected eyewear brands of the moment. Quintessentially British with great emphasis on artful craftsmanship and durability, Cutler & Gross spectacles are the modern gentleman's choice. This season's Cutler & Gross collection brings in trend-led elements for a contemporary spin on their slick frames. These camouflage D-Frames at Mr Porter are a particular favourite. Camouflage is an undeniable trend this season, and these stylish glasses are great for nodding to the trend without any novelties. They are £310 here. 3. The Kooples menswear is a personal favourite of mine. Slick without being over-the-top, each and every collection stays true to the brand's trademark cool-kid look. This suede and shearling biker jacket is a standout piece, along with the other casual jackets in the range. Zip detailing is big news for AW13, but this jacket will stand the test of time. It is £595 here. 4. If you are headed to fashion week, I don't doubt that you will require a bag big enough to fit all your essentials. While the croc holdall by Gucci is the ultimate, this slick and understated satchel from ASOS will look sharp in the meantime. 5. These turn-up trousers by Reiss are very smart and bang-on trend for the season ahead. A modern alternative to black, these tailored trousers are ideal for showing off polished new shoes. 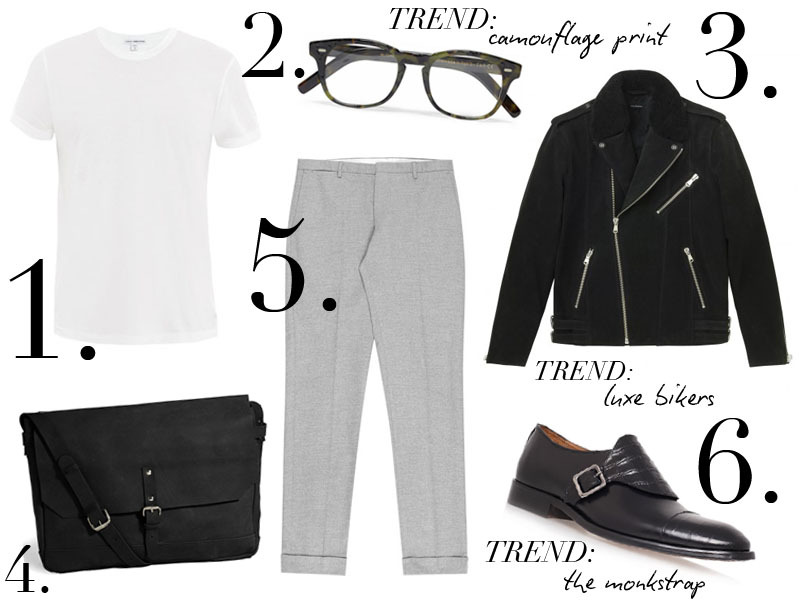 I also love the juxtaposition between the formal trouser and the James Dean biker. They are £105 here. 6. 1, 2 buckle your shoe! A smart shoe without the fuss of a brogue, the monk strap style is just the ticket for LFW. This leather pair by Kurt Geiger London, also available in brown and matte black, come complete with croc-print leather detailing for a fashion-forward touch. They are £195 here.